In 1872, two men met in Concord, Massachusetts to discuss the notion of a monument to honor the bravery and sacrifices of American patriots. The two were both remarkable men, but at very different stages of life. 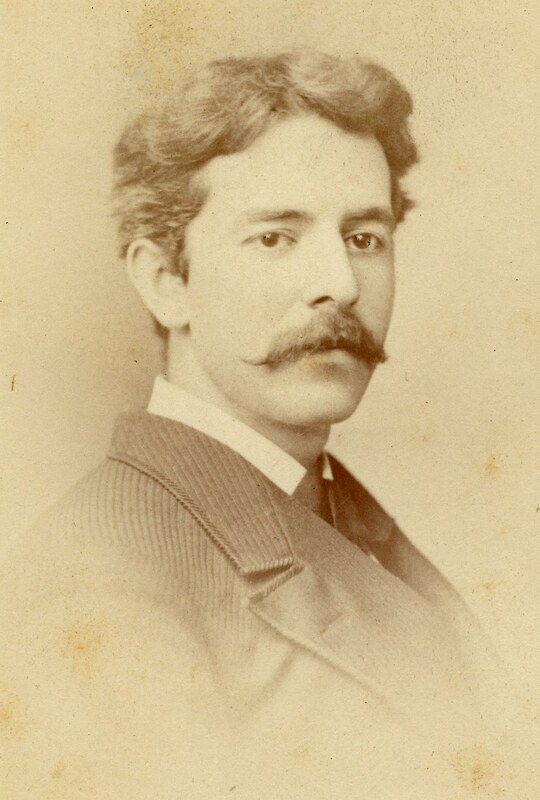 Daniel Chester French, at 22 years old, was a talented aspiring sculptor whose career had hardly begun. He had studied with accomplished artists but at this point he had yet to be commissioned for a public work. 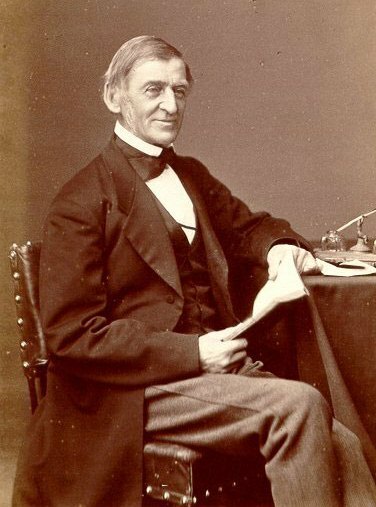 The other individual was Ralph Waldo Emerson, the great “Sage of Concord.” He was, of course, among the nation’s most famed lecturers and writers…the man who had, about forty years earlier, played a major role in launching the American Transcendentalist movement. But recently, his health had taken a turn. He was beginning to have memory problems. Over the next few years his public appearances would gradually wind down. The Town of Concord was making ready to pull out all the stops for a tremendous commemoration of the Concord Fight, the centennial of which would take place on April 19, 1875. 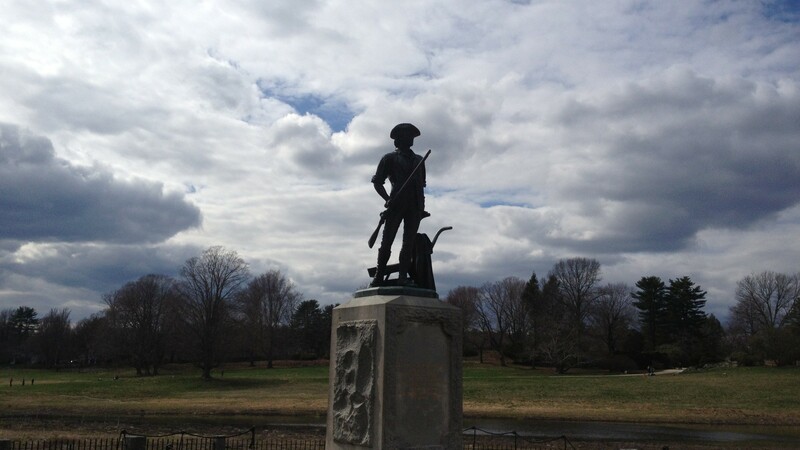 Part of the plans called for the unveiling of a new monument on the battlefield where American minutemen and militia had driven British Regulars from the Old North Bridge. A Monument Committee had been formed and they were seeking proposals from any interested sculptors. Emerson encouraged Dan to submit a proposal. They apparently met to discuss the matter, although exactly when and where this took place isn’t clear. Dan was living at the time with his father, Judge Henry Flagg French and step-mother Pamela French in Concord. Judge French was a native of Chester, New Hampshire (where Dan spent part of his childhood…and out of his fondness for the place decided to use its name as his own middle name). In addition to his accomplished legal career, the Judge was also a proponent of scientific developments in agriculture. He was the first president of the Massachusetts Agriculture College (now the University of Massachusetts Amherst…my alma mater), although he resigned before the institution actually opened. He was also the inventor of the “French Drain.” After moving to Concord in 1867 he became one of its leading citizens. If I were to venture a guess as to how the meeting played out, I would imagine that Emerson probably paid a visit to the French household and the Judge was likely present for their discussion of the monument. Emerson was certainly no stranger to the history of the Concord Fight and commemorations thereof. His grandfather, Rev. 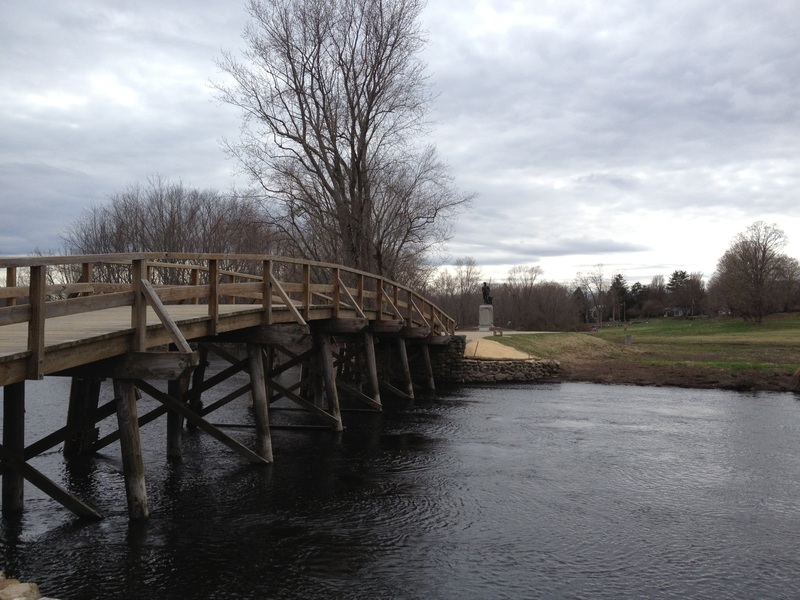 William Emerson, had preached to the citizen soldiers gathered in Concord on that dramatic day of April 19, 1775 and witnessed the ensuing battle at the Old North Bridge from his house (now known as the Old Manse) which stands just 400 feet from the Old North Bridge. Emerson had been asked, in 1835, to compose a hymn in honor of the 200th anniversary of Concord’s incorporation. The resulting Concord Hymn, about the “embattled farmers” and the “shot heard round the world,” was sung at the dedication of the first monument placed at the site of the bridge in 1837. The location of the 1837 granite obelisk did not sit well with many in Concord. It had been placed on the eastern bank, where the British had stood, because the western bank (where the Americans had made their advance) was no longer easily accessible. The Old North Bridge had been made redundant by a newer one placed a bit downstream and was torn down in 1793. The fact that the spot where the first Americans had lost their lives during the Concord Fight remained unmarked particularly rankled an old bachelor farmer named Ebenezer Hubbard. Upon his death in 1870, he left the Town of Concord $1,000 to place a monument on the American side of the Concord River and to reconstruct the Old North Bridge to provide access to it. And this is where Dan came in. The Town wanted a Minuteman. With a little persuading, Dan agreed to give a shot. During the early months of 1873, he worked on preparing a small clay model, about seven inches in height, to present to the Monument Committee. He tried out dozens of them. Minutemen in all possible poses…running, crouching, marching, standing still. Minutemen with their coats on, in their shirtsleeves, with their hats on and the their hats off. The room in the Judge’s house given over as Dan’s studio soon was filled with a miniature clay army. The study that Dan presented to the Monument Committee was substantially the same as the final product. A farmer holding a musket in his right hand with his left hand resting on a plow. He was in mid step. That first step towards the battlefield, before he had even relinquished his plow, Dan felt, was the moment the farmer became a soldier. The Monument Committee awarded him the commission…he would not receive any payment, but the honor of sculpting the monument was his. Initially, when he got the job, Dan felt a bit of panic. He had never created anything on this scale. And certainly not a memorial of such importance. He confided in his father that he didn’t think he could do it. The Judge calmly assured him that he would do all he could to help. And so the task of creating a more detailed, three-foot model began. This would also have to be approved by the committee. For this larger model, Dan spent a great deal of time studying Revolutionary War artifacts and clothing of that era. Old coats, hats and powder horns were dug out of Concord attics and Dan accepted them gratefully. His work attracted a great deal of attention and townsfolk…particularly young women eager to meet the young sculptor…came almost daily to the Judge’s house to visit. The Town had commissioned him to make a minuteman. No one in particular. Simply a representation of the hundreds of Americans who had converged on the Old North Bridge that day to defend their homes and their liberty. One historian, however, has argued that Dan was inspired by a specific figure. Roland Wells Robbins (1908-1987) was a self-educated historian and archaeologist. In 1945 he conducted an archaeological dig which located the site of Thoreau’s hut by Walden Pond. He would go on to conduct many more digs including one at the site of the first John Alden House in Duxbury, Massachusetts. Also in 1945, he published a work, “The Story of the Minuteman” in which he argued, based on French family letters, that Dan modeled “The Minuteman” after Captain Isaac Davis of Acton. It is an argument that I find convincing. I admit…I might be a little biased. Davis is the historical hero of the Town of Acton where I grew up (right next to Concord). He was elected captain of Acton’s Minute Company in the fall of 1774. Minutemen were volunteers who agreed to drill several times per week and to be ready in mere minutes in the event of an alarm. They were meant to be the more hardened companies, better prepared than the typical militiamen…although their actual level of proficiency varied from town to town. Isaac Davis was a gunsmith. This might have had something to do with his election as captain. He was determined that his Minute Company would be the best equipped and the best drilled in the Province of Massachusetts Bay. He outfitted his men with cartridge boxes and bayonets…essentially the same equipment the British Regulars carried. This was almost unique for a provincial company. And he drilled them in marksmanship at a make-shift shooting range on his farm all winter. The Acton company was moved to the head of the column with bayonets fixed. When they came within close range of the bridge, the British opened with sporadic fire. Davis was shot through the heart and became the first American officer killed during the Revolution. According to Robbins, Dan was inspired by Davis’s story and sought out his descendants to use as models. By Robbins’s account, the Judge even went to Acton to take photographs of them. And Acton lent a precious artifact, Captain Davis’s plow, for Dan to replicate in the statue. 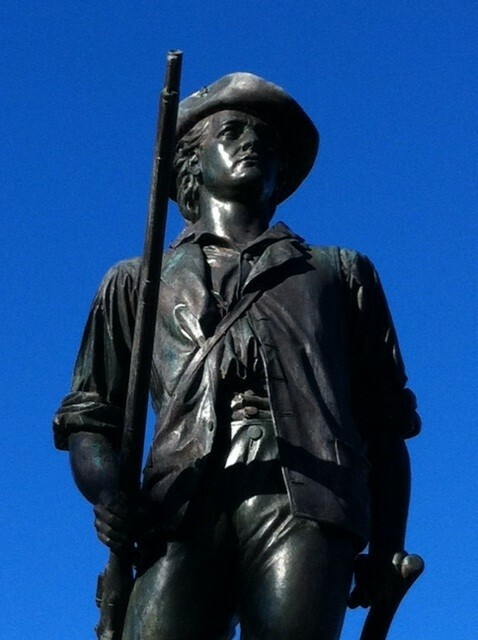 Publicly, Dan always asserted that the statue simply represented a minuteman. The Concord committee, after all, probably would not have been much pleased if told that the statue represented an Acton individual. Robbins’s argument might not be universally accepted. I have nonetheless always thought of the statue as Isaac. The three foot model was accepted in the fall of 1873. Dan then moved to a studio in Boston to create the final seven foot version. He rented a space in the famous Studio Building, a gathering place for artists, which once stood at the corner of Tremont and Bromfield streets in Boston. The final bronze statue was cast at the Ames Foundry in Chicopee using metal from Confederate cannons employed during the Civil War. On April 19, 1875, a massive procession of thousands, including President Grant, Vice-President Henry Wilson, nearly the entire cabinet, countless statesmen, and a variety of military units marched through Concord and across the newly reconstructed North Bridge. Emerson was there and read his Concord Hymn, the first stanza of which had been carved into the granite base of the statue. Dan was not there. He had accepted an invitation to study under a master of sculpture, Boston-born Thomas Ball at his studio in Florence, Italy (the best known among his many works is the equestrian statue of Washington in the Boston Public Garden). Dan was deeply torn when it came to missing the ceremony and the unveiling of his first public work. But there would be many more to come. 55 years later, in 1920, his magnum opus would be the statue of Abraham Lincoln in the Lincoln Memorial. I go to see “The Minuteman” (or Isaac) often. When I look at him I am always struck by the artful manner in which Dan captured the quintessential American, determined to face adversity with courage, calm resolve and strength. This determination is as powerful today as it was in 1775.